Nigeria's president has formally launched a national electronic identity card, which all Nigerians will have to have by 2019 if they want to vote. 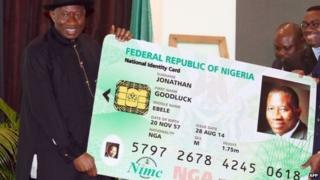 "The card is not only a means of certifying your identity, but also a personal database repository and payment card, all in your pocket," President Jonathan said at the launch in the capital, Abuja. "I have taken keen interest in this project, primarily because of the pervasive impact it can have on every facet of the socio-economic fabric of our dear nation," he said. According to Nigeria's central bank, about 30% of the country's 167 million inhabitants have access to bank accounts, Bloomberg news agency reports. "It breaks down one of the most significant barriers to financial inclusion - proof of identity," MasterCard's Daniel Monehin said in a statement. The new cards show a person's photograph, name, age and unique ID number - and 10 fingerprints and an iris are scanned during enrolment.